Kerry from our India and Arabia department is expecting her first child in September and recently traveled to Jordan on a babymoon. Here she shares her tips for traveling whilst pregnant and why Jordan is a great altnerative destination for mums-to-be! The perfect time to take a babymoon is in the second trimester as you should be over the morning sickness and feeling much more energised – you can travel up to 28 weeks before you need a note from your doctor. It will also be your last getaway before the baby arrives, so make sure you book somewhere special. We chose to travel to Jordan to visit the inspiring ruins of Petra and it has always been a dream of mine to float in the Dead Sea. You can now fly to Jordan with Easyjet, a route which launched earlier in the year but it is worth noting that the seats do not recline – I flew to Jordan on a 5 hour flight and it was just about bearable. Royal Jordanian is another option. When traveling long distances over land our luxury transfers are a must when your pregnant as the drivers are all English speaking and will make toilet stops when ever you need. 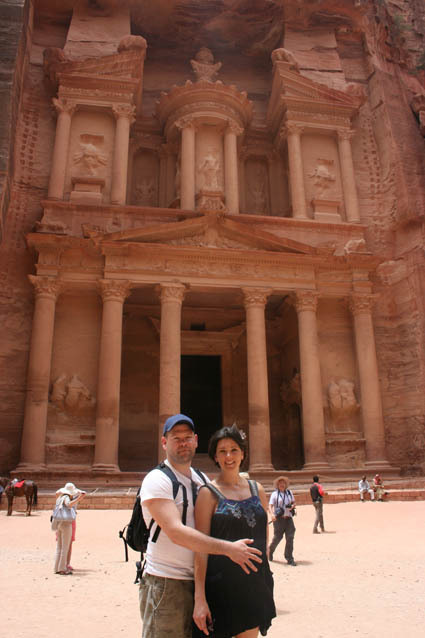 When visiting Petra it is best to avoid the months of July and August as the tour would be too hot – May is ideal and you can do a 3 hour walking tour. No need to panic with regards to toilets stops, there are a few strategically placed along the walk and the Scott Dunn English speaking guide will adapt the walk to your pace. There is also a restaurant located after half way down so you can stop to grab a bite to eat or drink. When in Petra they do offer you the chance to ride on the horse drawn cart but this is not recommended whilst pregnant. Floating in the Dead Sea was amazing – and highly recommended! The floating takes the pressure off your feet and helps any back pain plus it is so relaxing. It’s also great fun covering yourself in the dead sea mud which is good for your skin too. Whilst in Jordan, stay at the Evason Ma’In Hot Springs. Here you won’t have to miss out on the massages as they offer a special mummy massage perfect to relieve the aches and pains of pregnancy. Don’t forget – if traveling to the EU you are covered by your European health insurance so remember to pick up an application form at the post office.